August Macke set the theme-color, color, color. For this reason, the Kunstmuseum Bonn has dedicated itself to this topic, both in its collections, and its changing exhibitions. Inherent to color is always an abstract characteristic, away from the local color, the color which only defines an object. Color means freedom, departure, abstraction, radical definition. Rudolf De Crignis, whose work I was able to see for the first time four years ago in his New York studio, is one of these artists of the extreme, who, exercising restraint, strive for more. 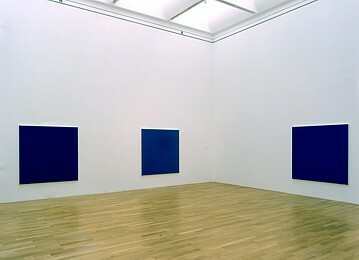 The Bonn works show us a white room with blue paintings, conceived for this room, bearing reference to one another, although they may just as well be viewed for their autonomous selves. This position taken by radical painting, the examinations undertaken on color upon a classic, right-angled painting is an extreme consequence, whose simplicity, however, actually contains a multitude of meaning. The viewer is forced to pass through the room, not noticing it, so to speak, or else to stand there, letting the room work on him for a long time, in order to perceive the differences in the monochrome works, to understand the autonomy of the medium of painting, the relinquishment of the word as well as the gesture of representation, or even a narrative tendency. The viewer loses customary distance, and perhaps emotion. What is radical about the radical searches out what is biologically biographical as an option to emotion and personal memory. 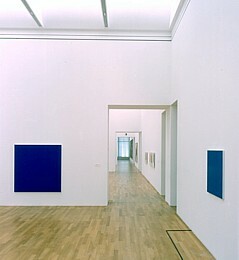 These rooms of color may be seen as alternating specific blocks of collecting in the Kunstmuseum Bonn. Thanks go to the artists and a collector family in Bonn who wish to remain unnamed. They are to be praised for their efforts, since their dedication is exemplary in every sense of the word. By including artists, who are not directly associated with painting in Germany, the collection has won a new tension, a new accent, when, for instance, the De Crignis room is compared with the room of Gotthard Graubner or the paintings of Katharina Grosse. New York's hard edge becomes clear, the restraint is articulated, precision shines through with all its might and without sentimentality. The works of the artist are to be viewed in a larger context, which in turn reflects specific conditions. They are the result of intensive efforts over the past years. De Crignis is striving to understand the art of painting in the sense of color painting, so that color represents the transparent appearance of light. In this respect, a comparison with the light installations of James Turrell seems appropriate. De Crignis understands his paintings as work in progress. Accordingly, each painting is part of a larger understanding of color and light, of art. And still, all five works in Bonn constitute one picture. At the Kunstmuseum Bonn, Rudolf De Crignis' installation is in Room 8. The theme is ultramarine. The paintings are hung relatively low for the museum, enabling an immediate physical confrontation for the viewer. The paintings penetrate the room and the viewer as well. When present in the room, he cannot escape the paintings. The paintings allow no reservedness. Their aesthetic distance extends all the way through the room to the other paintings. The viewer stands in the center and begins to understand and check his feelings in a new manner, in the face of all this blue. The viewer must work out for himself his way of viewing, his distances, his angles of view into the room. The paintings create something like a solid environment with an endless depth of light and color. This technique of painting on canvas revolves around the question of space, light, time, and identity. The ultramarine is the most immediate perception of the work on the surface. Nevertheless, it is only a kind of catalyst, since each painting has its own individual color vibrating in three dimensions. Depth is anchored there in the painting, but it is without the slightest painted perspective. The painting remains color alone. The longer the viewer looks, the more depth there is in the paintings, the more disconcerted the viewer becomes, the more is evoked in the viewer. These are perfect surfaces, painted in many layers. With each application of a layer of paint, done upon a white chalk ground, the light is reflected differently. Layer for layer, a body is built up, the canvas becomes a three-dimensional object. In all of the works, ultramarine is the main color in connection with other colors. The visible color surface is the result of the combination and saturation of various colors. But at the same time, in each work, there is also a friction and an interaction between contrasting colors. As much as these works form a closed entity, their effect is just as open. Their weight, their visible consequence, the proximity of their distances to one another demand from the viewer not only visual sight, the retina as a physical function, but also a level of understanding, a cerebral involvement; a psychological readiness to breathe the air of the paintings. This perception has not been predetermined, but may be experienced differently by each viewer. This room by De Crignis is an experiment, an experience, unique to each viewer, but at the same time possessing the larger understanding of expanded reality. Room 8 has been constructed as follows: It is a square room, with one longitudinal wall, two transverse walls and, opposite the longitudinal wall, a wall with passageways to the left and right, also containing openings leading into other rooms. The two works on the longitudinal wall have been centered around the middle axis; on the shorter transverse walls, the works have been centered around the middle axis as well, but only if one adds to them the wall openings, which become wall again above these openings; the painting on the shorter of the longitudinal walls has also been centered along the middle axis. With this room, De Crignis has left his Swiss heritage completely behind; there is nothing of explicable Calvinist clarity here, nothing of the Zurich constructivists and the formulas of these methodical artists. He has entered a new tradition, radical and emotional at the same time. Perhaps he views it as his task to reduce Mark Rothko to a minimal point so that all of the romantic elements fall away, knowing full well that the most profound perception is only possible when it is touched off by emotion.